Unable to open the physical file “C:\NewDB\NewDatabase.mdf”. Operating system error 5: “5(Access is denied.)”. 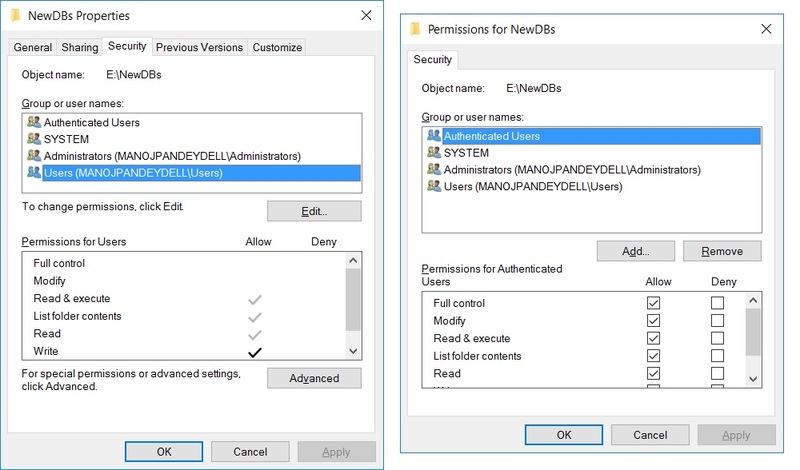 Well the error clearly mentions that the error is due to the limited access of Service Account by which SQL Services are running, it doesn’t have access to the new folder location where the database mdf/ldf files are moved. So, you just need to go to the new folder location, check the folder Properties and go to Securities tab, select the Service account and click on Edit button. On the new Security popup window click under the Allow checkbox for Full Control permission. Now execute the above Attach script and the Database will be attached without any issues.